Avril Graham is wearing the gorgeous Maniac necklace from Swarovski's new Fall/Winter 2010 collection. Last night I met up with my friends Martini and Sami at the Swarovski evening of style event hosted by the lovely Avril Graham. Avril is the Executive Fashion and Beauty editor of Harper's Bazaar and a regular style contributor on The Today Show. Avril shared some great tips on transofrming an outfit from day to night and she demonstrated this by styling models with Swarovski's newest pieces. I did not buy any jewelry because I just bought these pieces and I also prefer to shop when it is less crowded. I really enjoyed browsing the new collection, chatting with Avril about her style tips, and drinking the delicious sparkling white wine. But, I will be back to the store because I have my eye on a few amazing statement pieces. 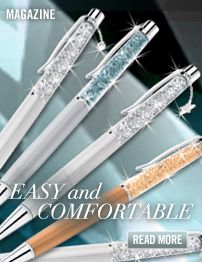 I did end up buying one of these beautiful crystalline pens. Here are just a few of the helpful tips Avril provided last night. 6. Don't be afraid to wear several bold accessories at one time. This can include a watch, cocktail rings, and crystal bracelets. I had the opportunity to meet and chat with Avril and she is so stylish and friendly. 1. I carried my make up bag with me and did a quick touch up before the event. 2. I switched from my bigger more conservative black bag (to hold my laptop) to a more casual brown handbag. 3. I added some Swarovski bangles for some extra sparkle in the evening. What are some of your favorite ways to transform your look from day to night?